This past Friday evening, January 5, as children were playing board games inside, security footage caught two hooded white supremacists climbing the steps of the Durham Solidarity Center to hang a flier on the door. The poster read ‘Protect Our Nation’ and contained anti-Semitic and pro-fascist imagery; it also read “Blood and Soil,” a phrase chanted by Neo-Confederates on August 12 at the Unite the Right rally. In the months since Charlottesville, posters have appeared on college campuses across the South, and even on utility poles in east Durham, urging neighborhoods to “Protect White Families.” Still others openly call for violent attacks on anti-racist activists. The government carries out this violence against Black and Brown people every day, and are responsible for the murders of 4 Black people in Durham in 2017 – 17 year old Uniece Fennell and James Earl Staton Jr in the Durham County Jail, and Kenneth Bailey and Willard Scott, Jr., killed by law enforcement officers in Durham. Meanwhile, the Durham defendants charged in the toppling of the statue continue to receive threats, several have had car windows smashed on multiple occasions. “On August 14th and 18th, Durham made it clear that we will take action to drive out white supremacy. We are on the side of freedom, justice, and liberation. With the coming anniversary of Dr. Martin Luther King, Jr Day, we are asking a simple question to our elected officials — which side of this are you on?” said Jess Jude, one of the anti-racist arrestees. “The continued insistence by the Durham Sheriff and District Attorney to pursue these felony charges shows that they would rather choose to stand on the side of these racist symbols and their champions, who lurk in the shadows under hoods, rather than take bold action to defend their communities from racist terror. “Governor Roy Cooper and the political leaders in Durham should look to the example set by the city council in Memphis, TN, who honored Dr. King’s sacrifice to their community by taking bold action to remove the statues of Nathan Bedford Forrest and Jefferson Davis, even through Tennessee had also adopted a statewide preemption law,” Raul Jimenez, one of the eight facing charges stemming from the monument toppling, commented. In 1960, King spoke at the Durham’s White Rock Baptist Church and urged anti-racists “to fill up the jails of the South.” Fifty-seven years later, over 100 Durhamites lined up at 8am at the Durham County Jail on Aug 17 to demand “arrest me too” in response to the warrants issued by the Sheriff. Sheriff Mike Andrews and DA Roger Echols continue to pursue felony and misdemeanor charges against eight anti-racist activists despite receiving thousands of calls from across the country calling for the charges to be dropped. “For all its significance, this struggle did not begin or end with any statue. Historic and institutional racism permeates our courts and jails. We find it in the school to prison pipeline, in racist and unchecked police violence. We see it when ICE and Trump criminalize migrants and destroy families through deportations. Our efforts to topple white supremacy and racism will continue. 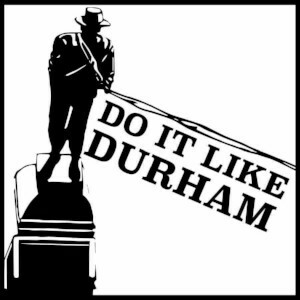 We tore that racist poster off of our door just like Durham tore that weak statue off of its base,” added Elena Everett, one of the anti-racist arrestees.